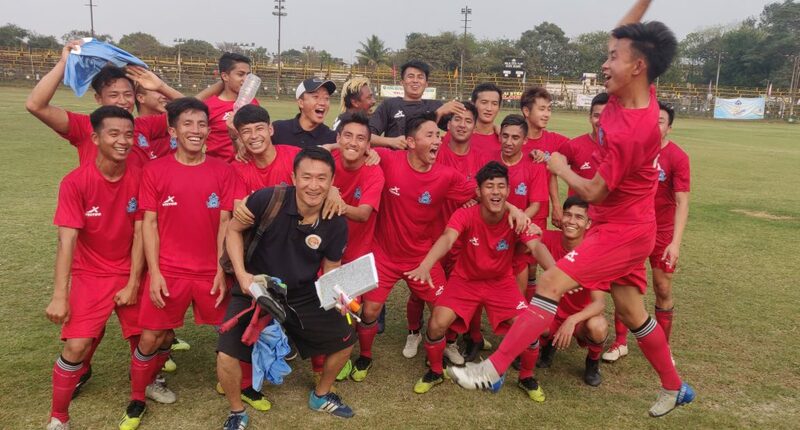 The Sikkim football team qualified for the final round of the prestigious 73rd Santosh Trophy National Football Championship 2019 after a gap of over a decade. Sikkim topped the group B from East Zone in the qualifying round to enter into the quarter-final round of the premier football tournament of the country. Sikkim qualified for the final round of Santosh Trophy last time in year 2004 inDelhi. In its last qualifying match played at Bhilai in Chhattisgarh on Thursday, Sikkim played 1-1 draw against the defending champion, West Bengal. Sonam Zangpo Bhutia scored a goal for Sikkim in a penalty shot. Sikkim finished the qualifying round on the top in the goal difference with a win and a draw. Sikkim was placed in group B of East Zone along with West Bengal and Bihar in the qualifying round of the tournament. Sikkim outplayed Bihar 4-1 in the first match and played 1-1 draw against West Bengal. As West Bengal defeated Bihar by solitary goal, so Sikkim has been qualified from the group in goal difference. Sikkim team captain Mayal Dok Lepcha expressed his immense happiness and satisfaction on being qualified for the final knock-out stage of the tournament. “A draw can take us to the quarter-final round but it was must win match for West Bengal. So, as per our preset strategy we played defensive and made counter-attacks from the start,” stated Lepcha. He mentioned that Sikkim got a penalty shot within five minutes of the start of the match for a foul, which was successfully converted into a goal by Sonam Zangpo Bhutia. However, West Bengal equalised the scoreline in the last minute of the first half. As per Sikkim team captain, the match was equally played with equal possession of the ball but Sikkim players missed some golden opportunities in the counter attacks otherwise final score-line could be different. “It is a very proud and happy moment for us to qualify for the final round of Santosh Trophy after a gap of over a decade. It is also a very memorable moment to eliminate the most successful team in Santosh Trophy, West Bengal with 32 times champion’s trophies and finalists for 41 times,” Lepcha said. He added that the morale of the team was very high to give its best in the quarter-final of the tournament, which was likely to start next month. The State team left Sikkim this evening for Neyveli in Tamil Nadu and will be reaching the venue on Saturday. Sikkim Football Association joint secretary Arjun Rai mentioned that it was a memorable moment as Sikkim gets qualified for the final round of Santosh Trophy. He mentioned that Sikkim qualified for the final round last time in 2004 at Delhi, which was led by Bhaichung Bhutia. He also stated the team has played as per the expectations of the selection committee. “We will organise another rigorous camp for the State team after they reach home to prepare for the final round of the tournament,” he said.